A Muslim impostor named Shadab eloped with an adolescent girl of Baghpat, UP by faking his name and religion, Hindi daily Dainik Jagran has reported. Firstly, he made a fake Facebook account named ‘Siddhant Choudhary’ and pretended to be a BJP worker. Thereafter, he started chatting with the girl and deceived her by making false promises. Few days later, he enticed her with help of his friends and ran away with her. A police case has been registered against three. Even after 4 days of registering the case, police has not been able to rescue the girl. The girl’s relatives are still traumatised, while several Hindu outfits are protesting over the incident. District President of Hindu Jagaran Manch, Deepak Bamnauli said the incident is related to Love Jihad. He said that these kind of incidents will not be tolerated and he will protest outside SP Office for the return of the girl. The case has been lodged against Shadab (son of Shekhawat) from Loni, his cousin Shoaib (son of Gaffar) from Harchandpur and Aditya from Sirsana. According to sources, the accused may be hiding with the girl in Mumbai. Some relatives of one of the accused live in Mumbai. Accused ‘Sidhhant Chaudhary’ has posted “IS” on his Facebook account on 28th June. Five people have liked the post. What does it mean? Either the accused or the police investigation shall reveal this. SP Jay Prakash has admitted that the matter is serious and a complaint has been lodged against 3 people regarding kidnapping of the adolescent girl. Local Police has been instructed to recover the girl as soon as possible. One or two of the accused may be in the friend list of the main accused Shadab, alias ‘Siddhant Choudhary’. Police said that they have not yet seen the accused’s Facebook account, and that further action will be taken after properly investigating the Facebook account. A look at the Facebook profile of accused Shadab tells that he has left no stone unturned in concealing his identity and convincing people that he is a Hindu. A lot of planning and effort was put in by the accused to entice the girl. 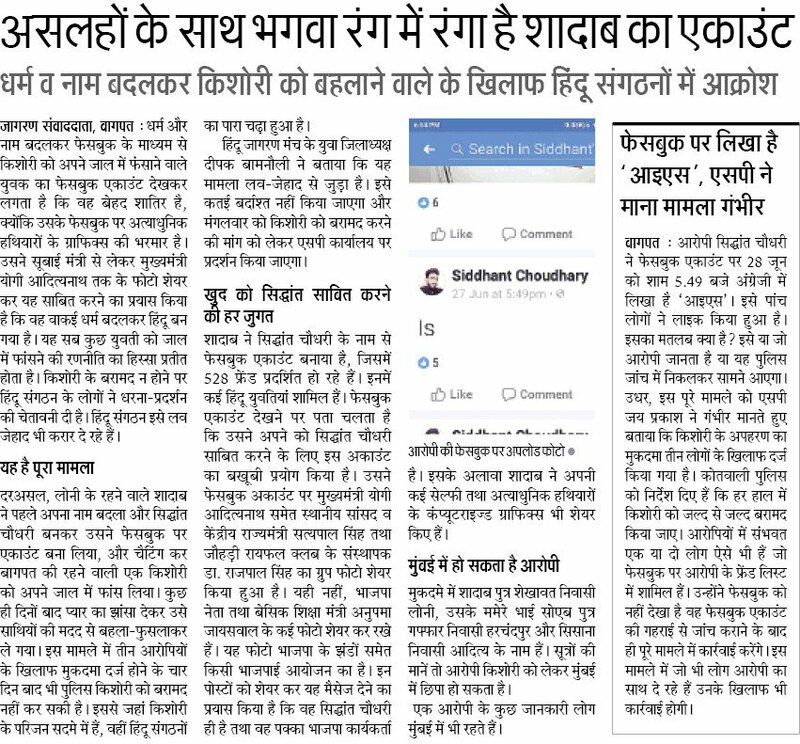 He has shared photos of local MP and central minister Satyapal Singh and UP CM Yogi Adityanath on his timeline, along with photos of other BJP programs and group photos with some local Hindu community leaders -all this to prove that he is a Hindu and a committed BJP worker on top. His account shows 528 friends, including many Hindu girls. Moreover, many selfies and graphics of latest weaponry can also be seen on his account.